Pesto chicken pasta makes for the perfect quick 30 minute weeknight dinner. Dairy Free recipe with a creamy coconut milk based sauce plus extra flavors of toasted almonds, fried garlic chips and fresh herbs. Gluten-Free too. 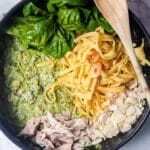 …………..Click HERE to PIN this Recipe for Later…………..
Pesto chicken pasta is my go to pasta recipe. I mean it makes sense right? I can’t have pesto in my blog title without being a die hard fan. I’ve never love a rich bolognese tomato meat based sauce and for years that all I knew. And then I discovered pesto. And then I discovered home made pesto. Since then it’s been pesto chicken pasta for me all along. But I wanted more than just a pesto centric sauce – I wanted it to be creamy as well. Coconut milk to the rescue. Since I started feeling way better after cutting dairy out of my diet I needed to come up with some seriously creative ways to imitate that silky creamy dairy like quality. Coconut milk has never let me down. While some people might be uber sensitive to the coconut flavor and proclaim that coconut milk totally overwhelms their taste buds in a dish –> for me this is not the case. While I’m not a huge fan of coconut flavored desserts, coconut milk in savory recipes works perfectly if you ask me. 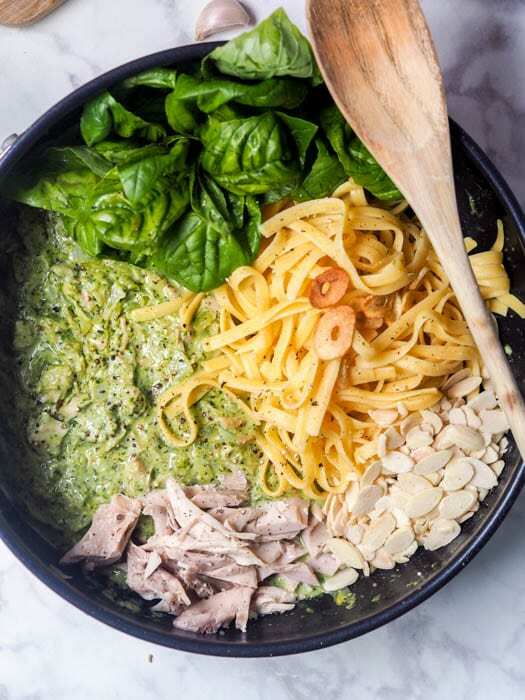 And so this pesto chicken pasta recipe is made with shredded rotisserie chicken, almonds, fried garlic, pesto, coconut milk and fresh herbs. 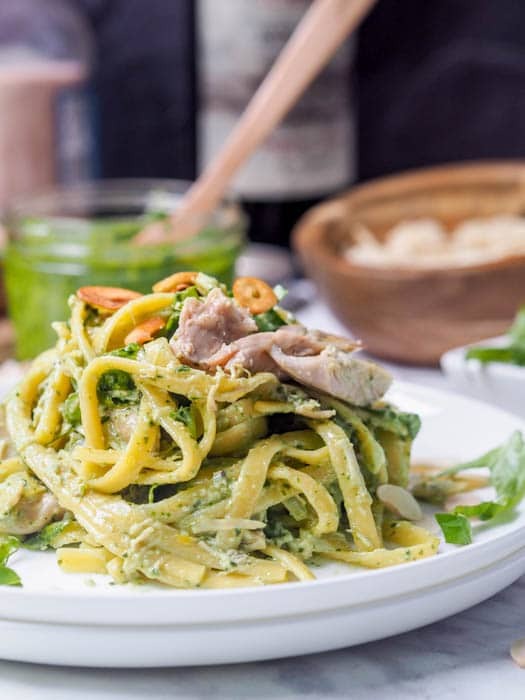 With a full home made batch of vegan pesto, this pesto chicken pasta is simply magical. Perfection is all I need to say. The silky smooth velvety herb infused sauce gets just the right amount of crunch from the toasted almonds and pan fried garlic chips. Have you had garlic chips before? You’ve got to. They are down right incredible. Like miniature sized chips but with a hint of garlic. I kid you not — I try to add these to just about everything (pasta, salads, you name it). And they don’t need to be deep fried. Just a shallow fry in some olive oil, which then get’s infused with the garlicky scent and is reused for cooking all the other ingredients. To make this pesto chicken pasta recipe vegan just use veggies in place of the chicken. I have made this recipe with thinly sliced zucchini and chickpeas instead of the chicken for a vegetarian in my group and he loved it! For another vegan and gluten free pasta recipe be sure to check out my Vegan Fettuccine Alfredo with Caramelized Squash and Red Onions – you simply won’t believe that cauliflower can be the base of a creamy, healthy and delicious pasta sauce! So if you’re looking for a pesto chicken pasta that is creamy yet also dairy free coconut milk is the way to go. Don’t skimp on the toasted almonds and fried garlic chips either — they all go together perfectly. Heat olive oil in pan over medium heat and add the thinly sliced garlic. Cook until just starting to brown and remove from pan. Drain on paper towels. To the same pan with the oil add onion and minced garlic and cook for a few minutes until onion is translucent. Add shredded chicken and cook for a few minutes until lightly browned. Add pesto, wine, and coconut milk. Reduce heat to medium-low and simmer for a few minutes. Serve sauce with pasta, topped with toasted almonds, fried garlic and fresh basil. This creamy coconut pesto pasta really does look perfect! Love the added garlic chips and almond on top too. Looking forward to trying this soon. Thank you. Thanks so much! I’m obsessed with garlic chips and think they go well with just about any savory dish : ) Enjoy!! YUP…this looks tasty and perfect…going to try this. Thanks for sharing. Stopping by from Share You rStuff Tuesdays. This meal looks fantastic! Love the pesto with the basil and spinach in it and I adore coconut milk so this looks like a winner to me. Can’t wait to try it. Thanks for sharing on Tasty Tuesdays. Love a good chicken pasta. I found you over at the The Wednesday Round-Up link party. I host Tickle My Tastebuds Tuesday and would love it if you linked up this recipe. I’m sure our party goers would love it as much as I do. Here is the link http://bit.ly/1wsjSLy. Have a wonderful day!! Vicky, this looks so delicious. Thanks for sharing it at Gluten-Free Wednesdays. Please include a link back so we can share your recipe even more! We would just love your creamy Chicken Pesto Pasta dish, it looks delicious! Hope you have a great weekend and thank you so much for sharing with Full Plate Thursday! oh, my, this sounds delicious. You had me at pesto but then I was completely sold when I read about the garlic chips. I’m putting this on my menu this week. Thanks for sharing at Simple Lives Thursday! I was in Peru in 2004 when they were in the World Cup…I still remember men hoarding around television stores watching games…it was crazy in an exhilarating way. Here, I just don’t have the energy-in China the games are at 12 and 4 AM…apparently there have been a few people sent to the hospital for exhaustion. Who are you rooting for as of now? I’m about to make this and am a bit confused…is it garlic or ginger that I add after I make the “garlic chips”??? (see directions, which are creating confusion). Tonight I will be adding a LOT of garlic to the recipe, so I guess we’ll find out if it is too garlicky…then I’ll know it was garlic for the chips and ginger for the next ingredient….THANKS. So Sorry for the confusion! Instead of minced ginger in the directions it is supposed to say minced garlic (there is no ginger in this recipe). There are two ways the garlic is added both minced and sliced. The thinly sliced 4 cloves turn into garlic “chips” whereas the minced garlic is just added to the recipe as usual. So sorry again for the typo – I have fixed it now. Completely unrelated to your recipe, but I was in Mostar on that same night. I was there with the fireworks and the flags sporting my Bosnian flag. Small world. I went to Croatia and 14 other countries as well. Cheers to a fellow traveler and foodie! I made this tonight with the basil vegan pesto. It was delicious! Thank you for introducing a dish and a pesto that I enjoyed making and eating. I’ll definitely be giving the sun dried tomato pesto a go next. Made this last night and it turned out amazing! love the fried garlic on top. A definite keeper! Yayy so glad you liked it! The fried garlic is the BEST! I will omit the garlic & onion and use flavored olive oil instead. (Low FODMAP diet) I don’t cook with wine. Should I substitute it with something else or just leave it out? Instead of wine you can add some chicken broth, additional coconut milk or just omit it. Enjoy! This reminds me a bit of one of my all-time favorite copycat recipes – pesto cavatappi from Noodles & Co. I used to love that stuff so much, and now that I started making at home, the restaurant version just doesn’t even compare! Of course that one uses a cream sauce, so I really love the idea of swapping in coconut milk to make it dairy-free if that is an issue for any diners, not to mention probably far healthier! Haha yes when you start making copycat versions at home they immediately out do the restaurant versions of the dishes themselves! Have totally had this happen too! 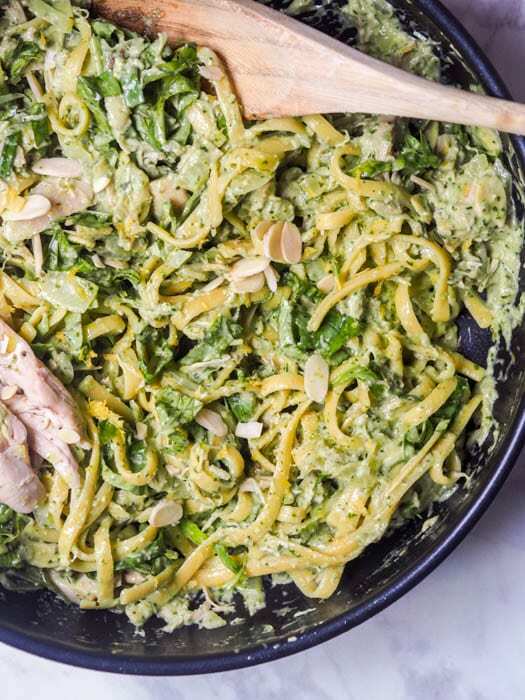 Love the creaminess of this pesto chicken pasta. Made me crave for a plate. I guess this will be our dinner tonight, Thanks for the recipe. Thanks! Hope you enjoy my recipe! Perfect recipe for you then!! I love a good pasta dish. They are so comforting and such family favourites. We often add pesto too. Super tasty. Definitely! Pasta makes for a perfect family dinner! Pesto and coconut milk! Now that I gotta try! Thanks so much for the vegan substitutions too!! Yes this recipe works perfectly without chicken, with chickpeas and zucchini instead! I really hope you don’t mind, but I am posting so many of your recipes on my Facebook page! I always include the website where the recipe came from, so I hope it sends more people your way 🙂 Love love love your stuff! Of course I do not mind!! Thanks for sharing and hope you’ve been enjoying my recipes!